Be still my heart…I love an all white bed and I love the duvet cover I got from Serena & Lily last fall, it is so soft, that I imagine it is what it must be like to sleep in clouds. So when I just took a peak at what is new on their site, I was so excited to see an all white duvet cover. According to the description it has a matelessé fabric (which means it’s loftier and more textured than standard duvet covers) and a delicate fringe along the edges. Sounds and looks like a bed I want to jump into and cozy up with a good book or a nap. And there isn’t just one new duvet that got me excited, but two more.. well, I really like them all! 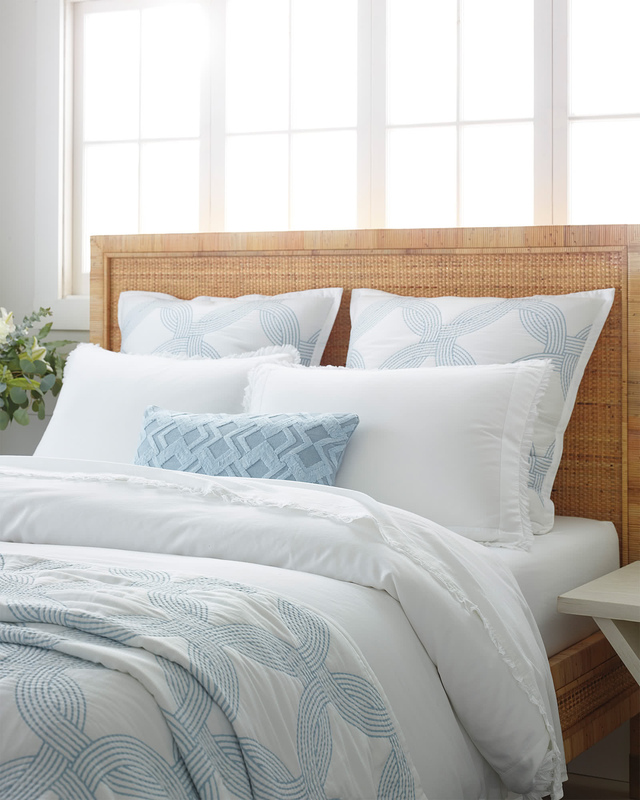 A gorgeous Oyster Bay duvet cover also caught my eye and the sky blue border duvet is also on my list. Trouble is, I always want new towels and to redecorate my whole house when I go on their website!!! I LOVE MY WHITE WITH EMERALD LUCKY DUVET COVER FROM JILL SORENSEN.